In what might be the biggest 'leap' in cycling for 2008, the newly reformed team Astana, now led by current Tour de France winner Alberto Contador (ESP), American Champion Levi Leipheimer, and Team Director and 8-time Tour de France mastermind Johan Bruyneel, will be powered by SRAM road componentry. Team Astana will be exclusively riding and racing the World's lightest 1928 gram SRAM RED road gruppo, just introduced this past September at Eurobike. While RED was launched as the most ergonomically refined and technologically advanced road group in the world, with numerous efficiencies and features, it was the weight story that caught Bruyneel's attention. "SRAM has proven itself at the highest levels of cycling, but having the lightest gruppo in the World with RED, along with all the function and features, is a real advantage. They are making serious impressions in the road market and we would not consider partnering with them if it wouldn't benefit this team (Astana) and put us in a position to win." 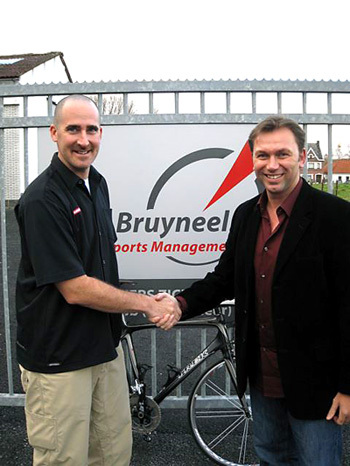 Astana General Manager Johan Bruyneel. SRAM's Global Marketing Director, David Zimberoff, traveled to Astana's Team headquarters in early November to finalize the three year agreement. "Johan's proven leadership and legacy of success was the perfect opportunity for us to demonstrate the pure advantages of our road drivetrain and, most specifically, RED. Prior to the agreement we had Alberto Contador and Levi Leipheimer test ride RED groupsets and they gave enthusiastic thumbs up. That is the type of verification that excites us at SRAM and we are truly looking forward to 2008," stated David Zimberoff.